The 20” CE Lite-50, cleanly cut vinyl for apparel, decals, and more with 210g of cutting force. 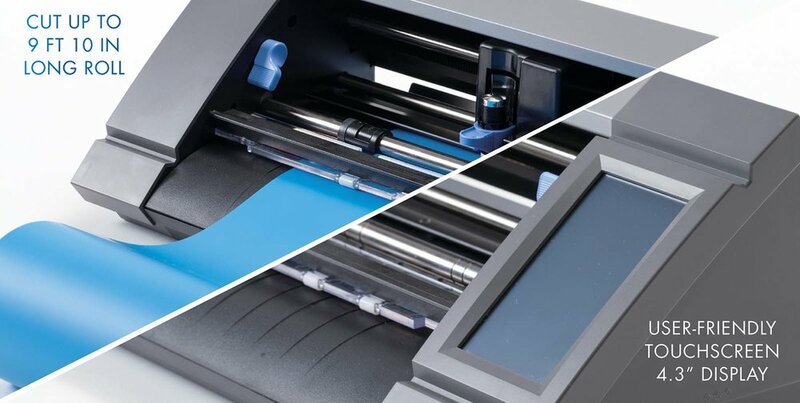 The CE Lite-50 is compatible with both sheets and rolls of media using the included roll holder attachment. Renowned Graphtec ARMS 7.0 (Advanced Registration Mark Sensing System) technology provides efficient functions and high precision contour cutting (Print & cut) results. USB offline barcoding automatically loads file, sets tool conditions, and processes the job at the push of a button – without requiring a PC connection. Its sensor is able to detect registration marks on various materials including glitter and metallic, expanding the range of compatible media for print & cut applications, smaller side margin and the ability to cut printed objects outside of the registration mark area yields up to 30% additional output compared to alternative brands. Saved cut-data on USB memory, USB offline barcoding automatically loads file, sets tool conditions, and processes the job at the push of a button - without requiring a PC connection. There are 3 types of pen adapter to match the width of water based felt-tipped pen. *There are cases where the pen is not available depends on the shape. CAUTION when moving the tool carriage of CE Lite-50, be sure to move the tool carriage slowly. 1) Release the push rollers by setting both sides of the set levers to "0" position before moving the tool carriage. Tool carriage can not be moved manually unless HOME screen is displayed. 2) Gently hold both sides of the tool carriage, not the lock lever or the tool holder. 3) If the media can not be removed due to jamming, turn off the power and moving the tool carriage carefully to remove the media. Please refer to the user's manual for details.